Here at The Liberty, we know that Romford is home to some of the kindest and most caring people you can imagine, and there is nothing more stylish than kindness. You’ve given generously to our chosen charities, donated unwanted clothes to those in need and we see people doing good deeds in and around the shopping centre every day. With International Random Acts of Kindness (RAK) week fast approaching, we want to show the world how kindness is done – Essex style. To help spread the love, we’ve created a simple ‘Random Acts of Kindness’ bingo game that anyone can take part in. 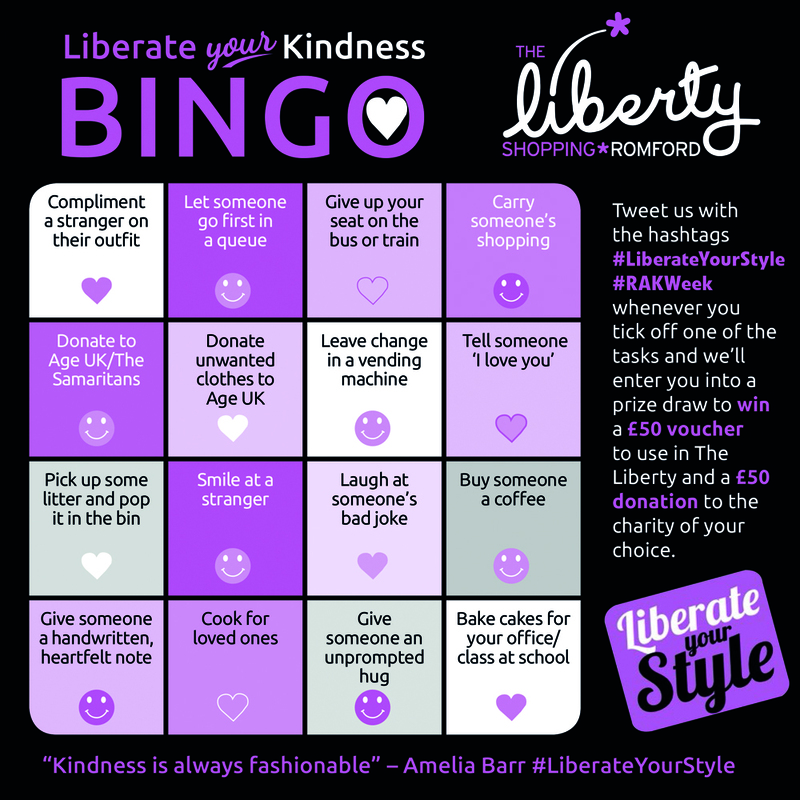 Between Monday 9th and Sunday 15th February 2015, simply tick off each of the good deeds below on the bingo card and tweet about it using the hashtags #LiberateYourStyle #RAKWeek. Each time you do, you’ll be entered into a prize draw to win a £50 retailer voucher and a £50 donation to a charity of your choice. If you complete one task you’ll be entered once, if you get a full house, you’ll have 16 chances to win. So go on, start ticking off those good deeds!